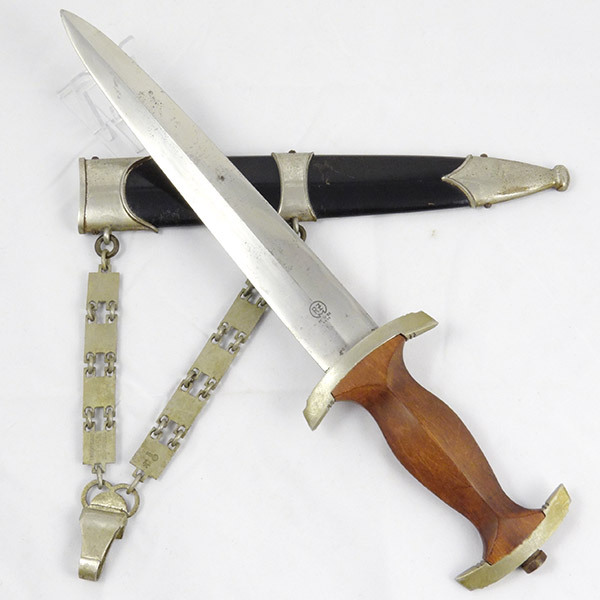 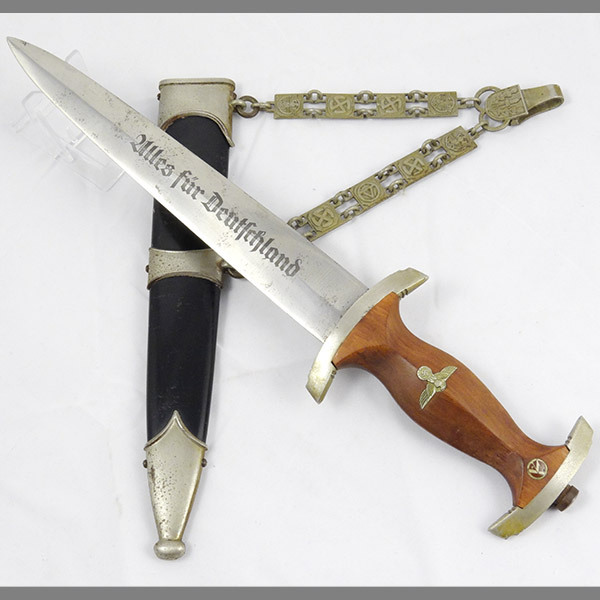 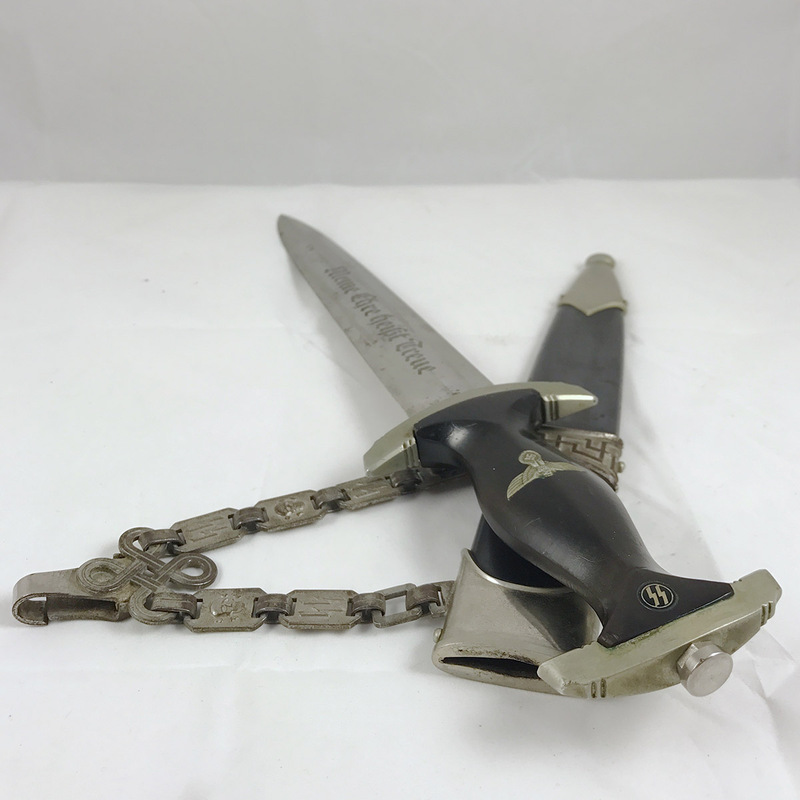 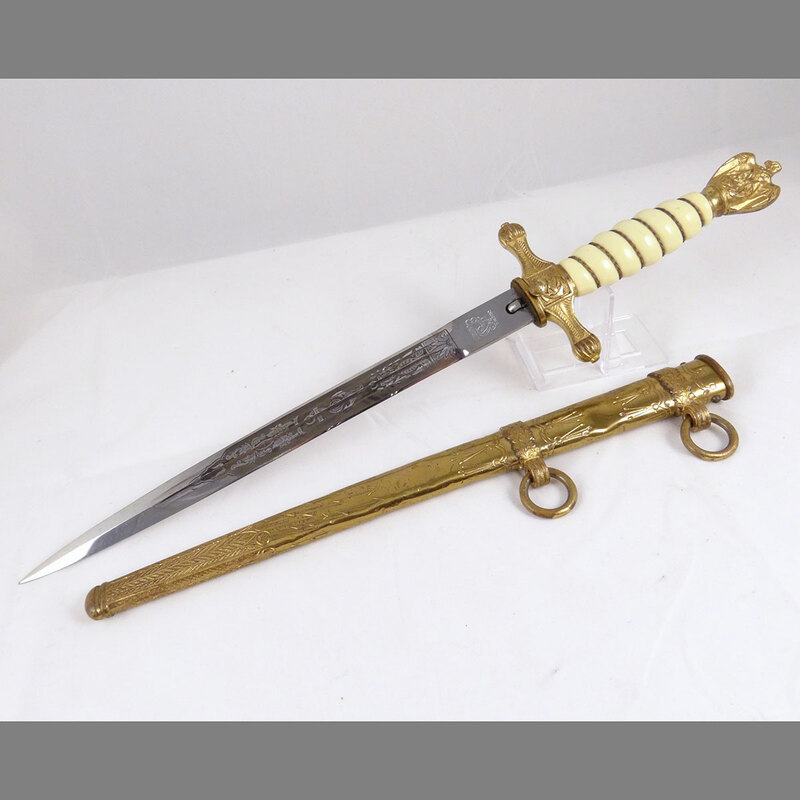 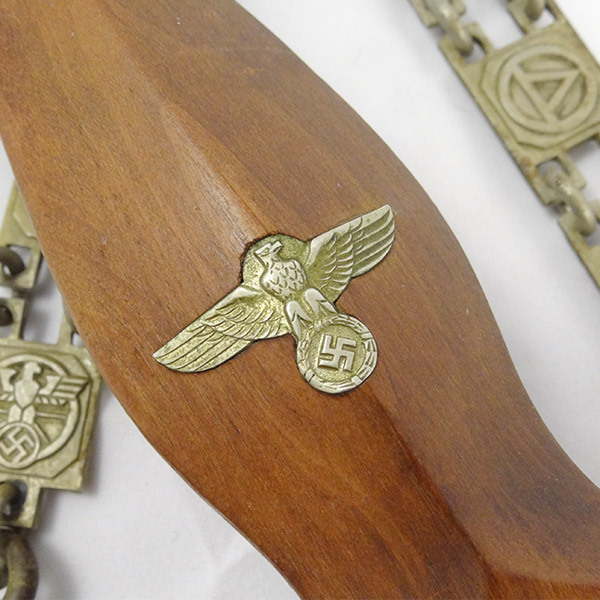 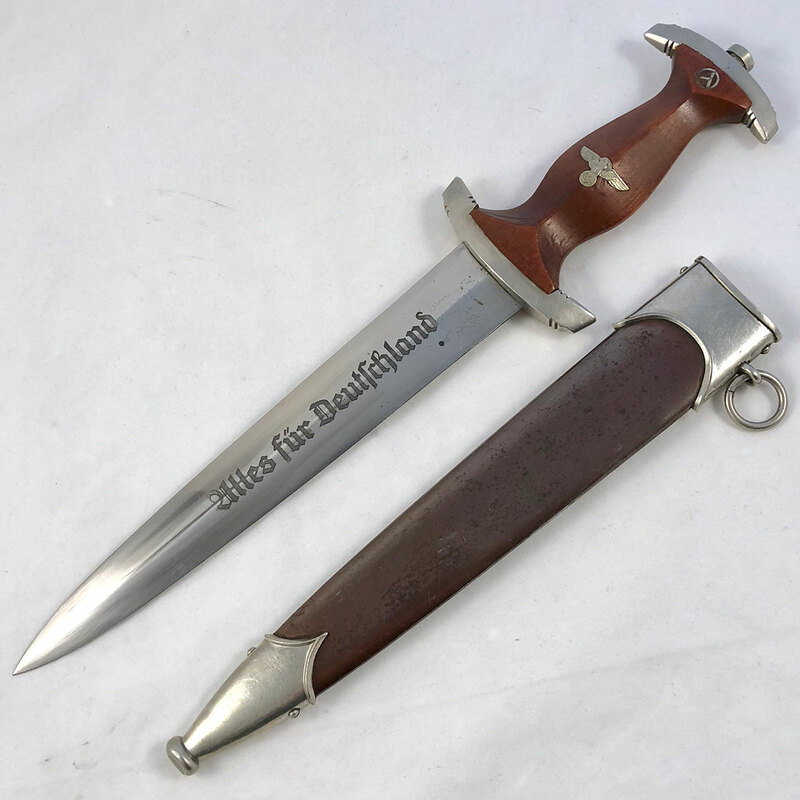 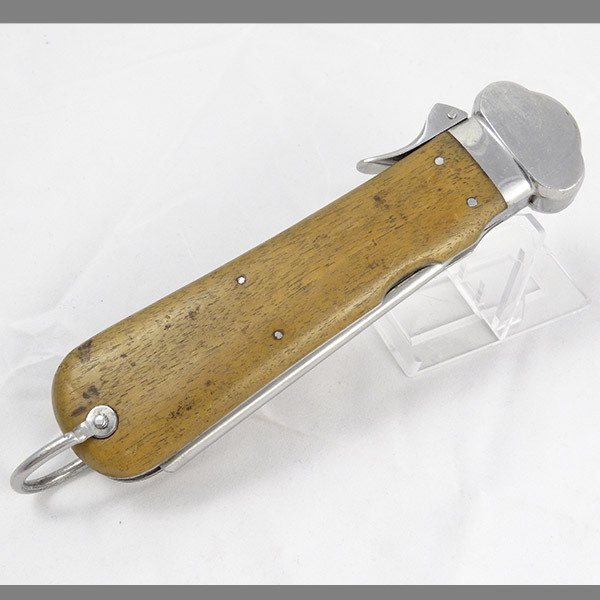 What a rare treat it is to find such a nice Chained NSKK dagger with so many great attributes. 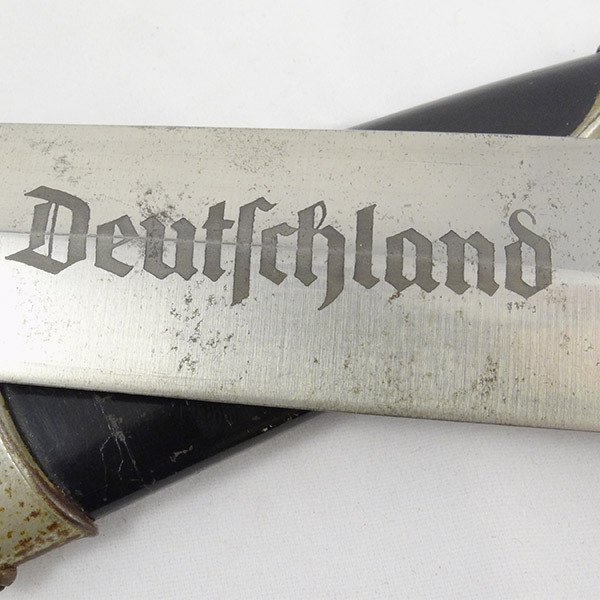 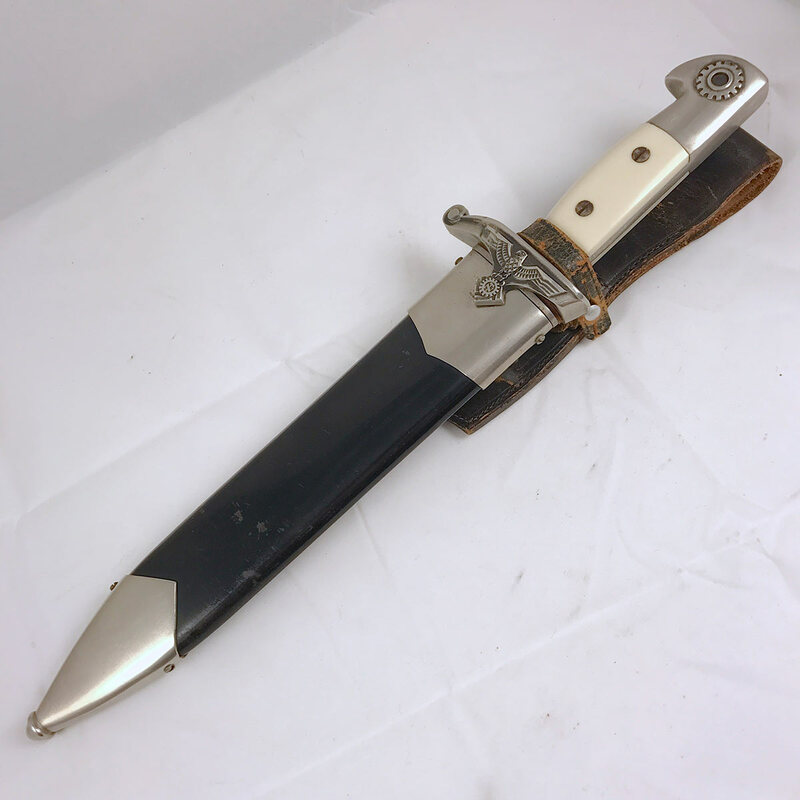 This Eickhorn dagger has the earlier 1939 dated blade, nickel chain with the Assman “A” logo stamp, nickel eagle, and the perfect blend of age and beauty in an overall condition that is hard to come by these days. 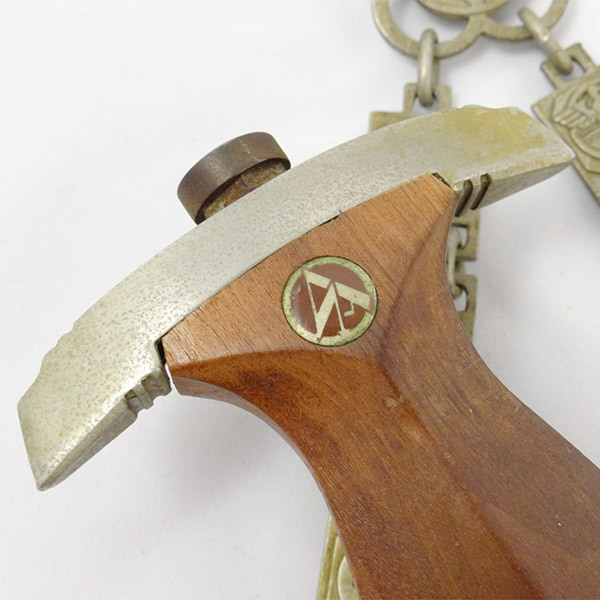 Starting at the top we see a near perfect grip with a stunning nickel eagle and SA roundel. 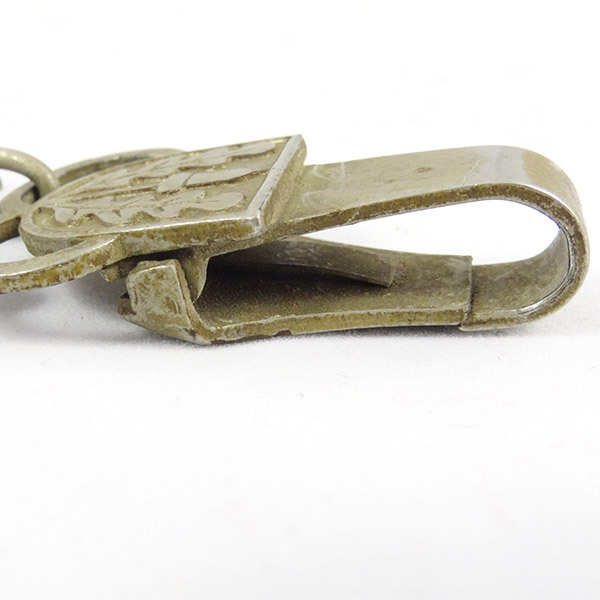 The eagle still has easily 90% of its original factory detail, and the roundel isn’t far off with no loss of enamel and the typical light dusting of green verdigris from age that we like to see. 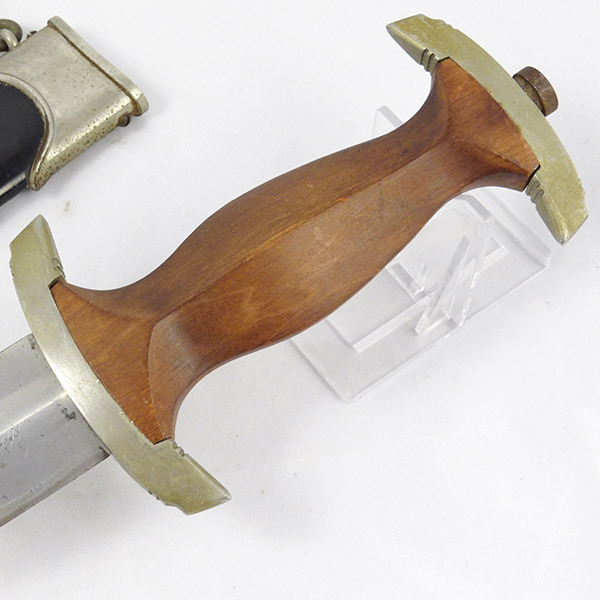 The nickel plated upper and lower guards show a nice age tone without the typical peeling and bubbling we tend to see with these plated guards. 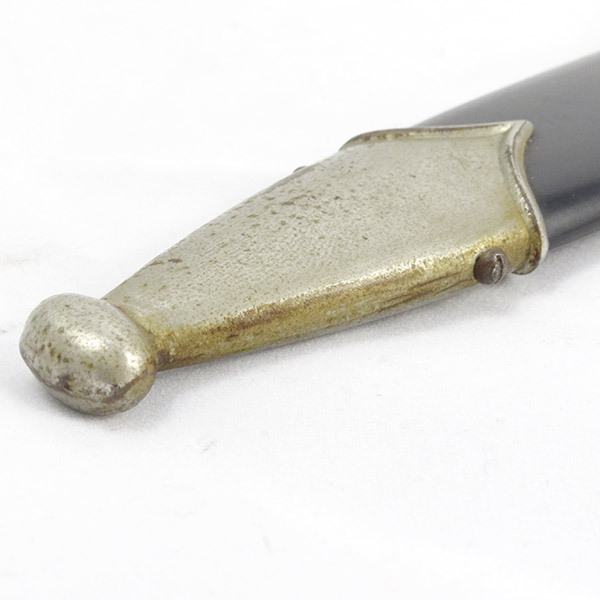 The pommel nut has turned the dark tone that is typical with the plated type nuts, and shows no signs at all of having ever been turned (there is no gnawing or chewing on the nut or the base of the upper guard). 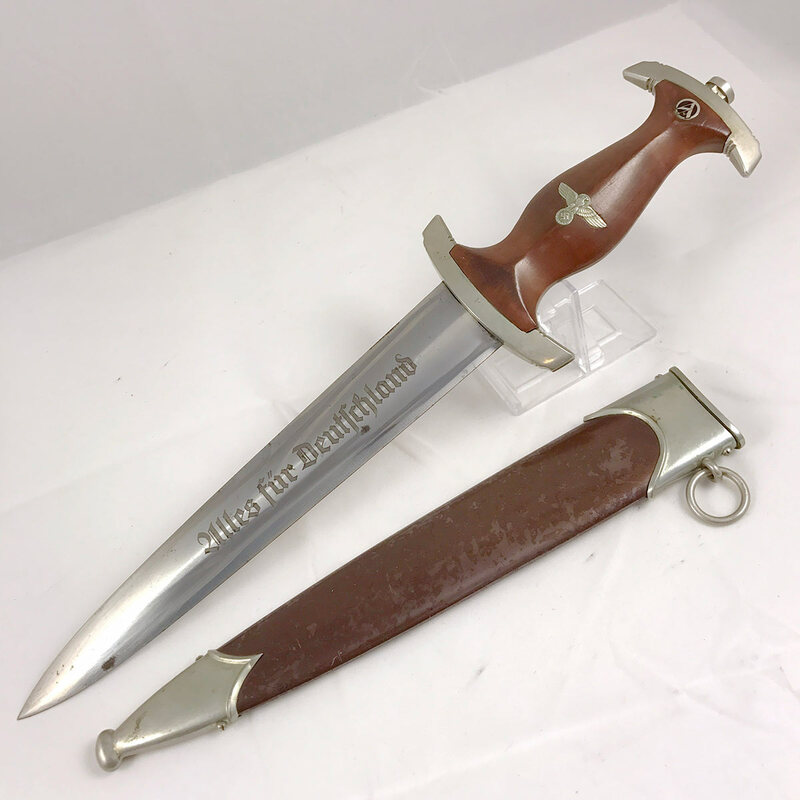 Moving to the blade we see a magnificently preserved medium gray motto against a nice shiny surface with a very prominent crossgrain. 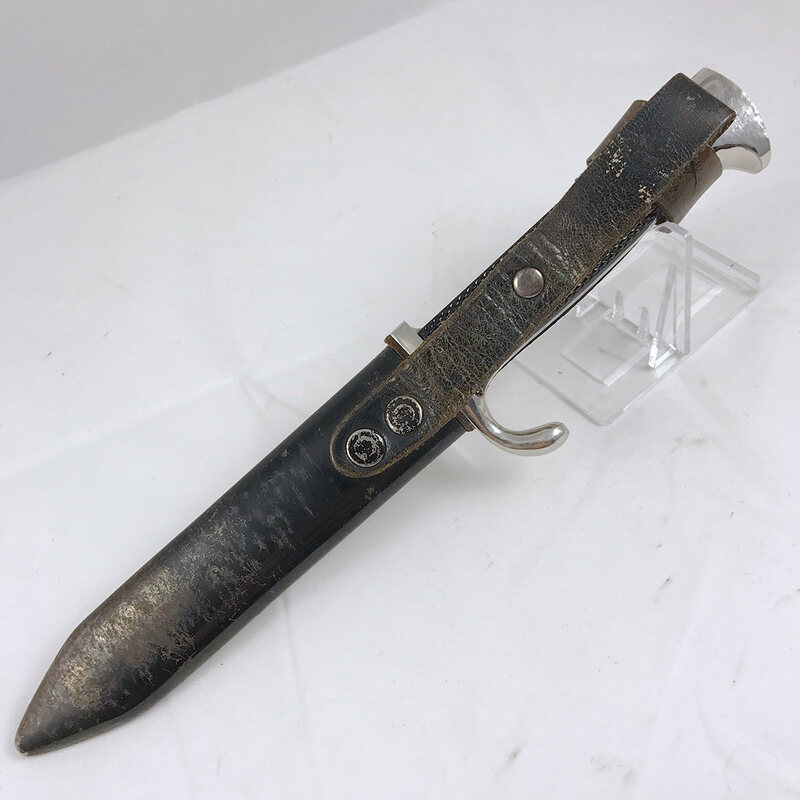 There is a peppering of oxidation spotting in places (see photos) but nothing like we’re used to seeing with these Chained NSKK daggers. 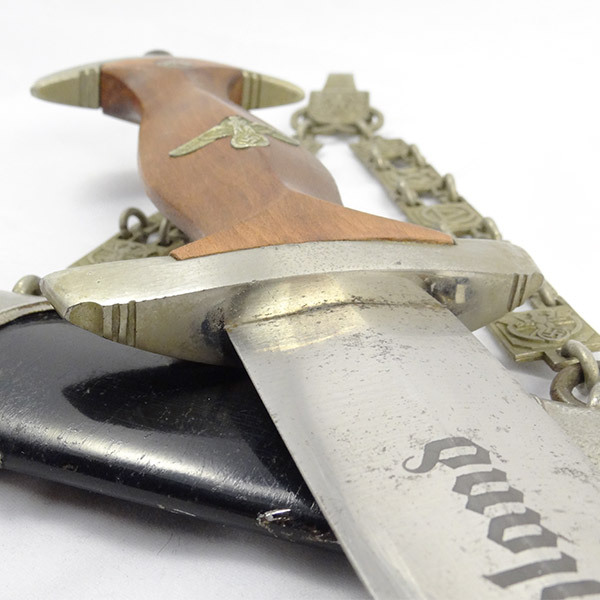 This blade is one of the best we’ve seen on this type of dagger! 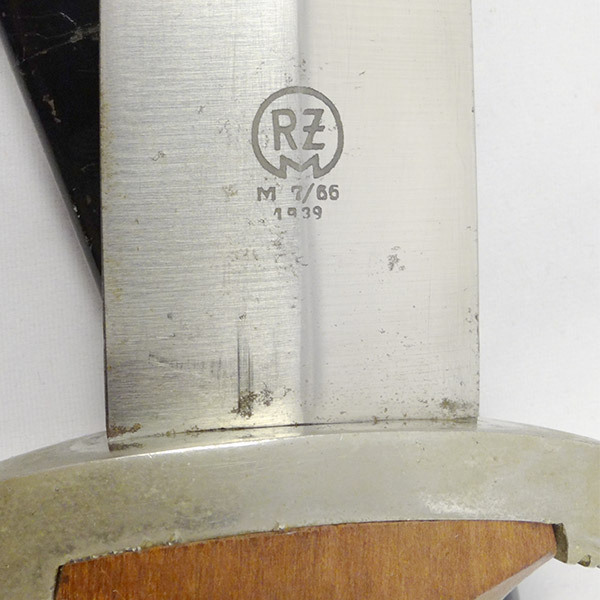 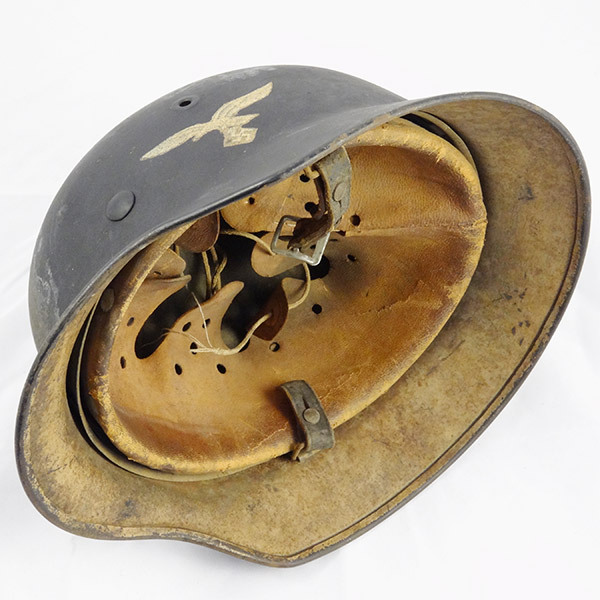 On the blades reverse we have the 1939 Eickhorn RZM 7/66 mark in the same medium gray tone as the motto. 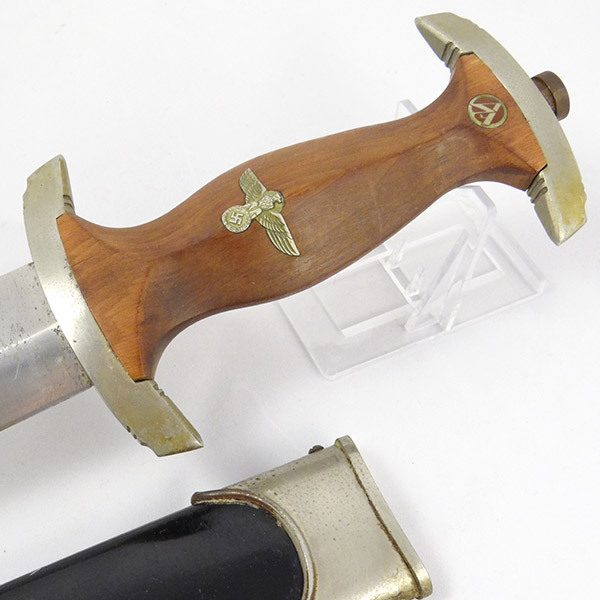 The fit of the blade shoulders to the lower guard is nice and tight – fits like a glove! 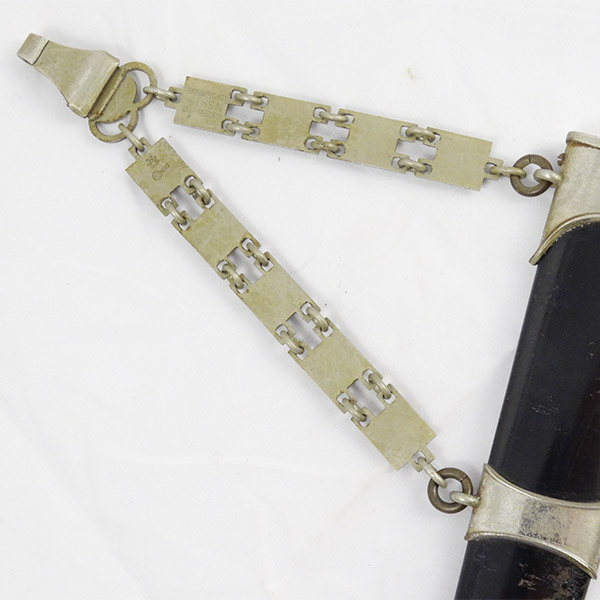 The scabbard is the painted type with the three fittings showing a consistent (matching) level of wear and age between them. 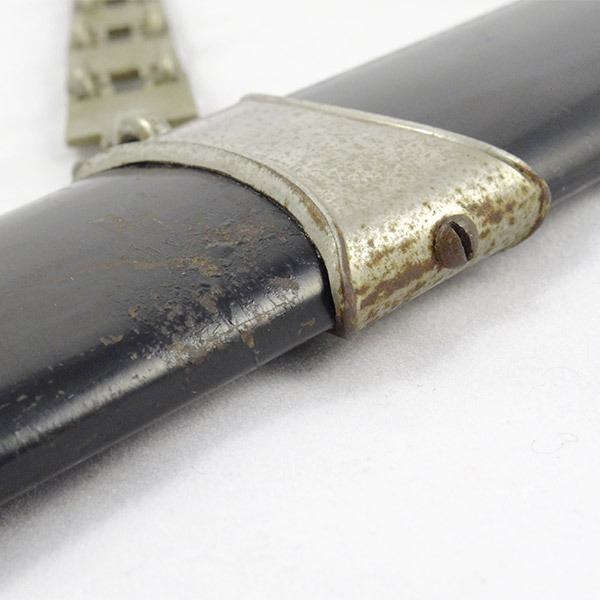 The screws are all tight and show no signs of having been messed with. 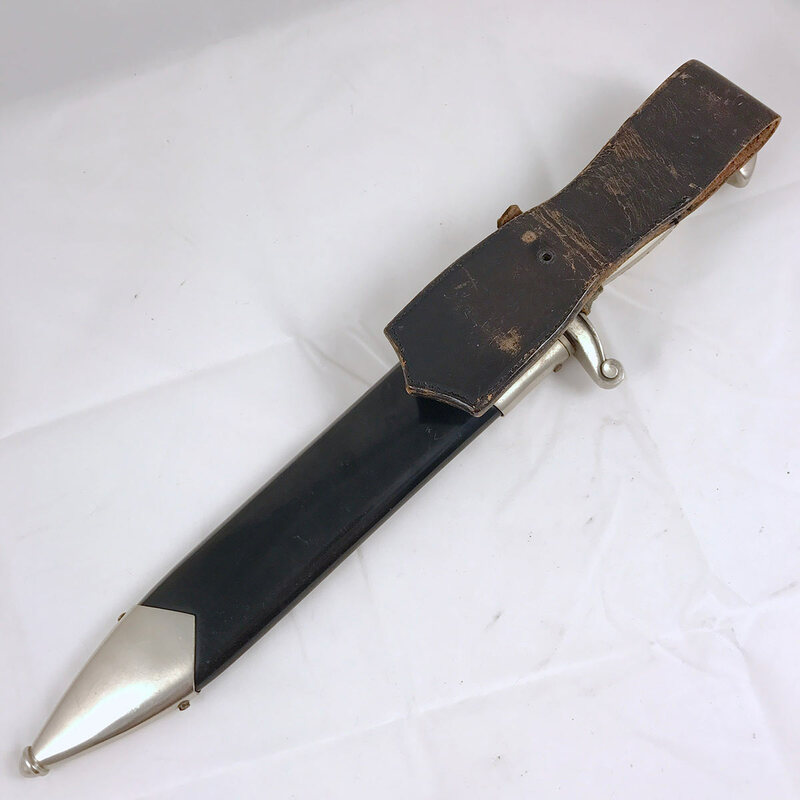 The period applied black scabbard body paint is nice and even, showing some of the spidering that we look for with a dagger of this age. 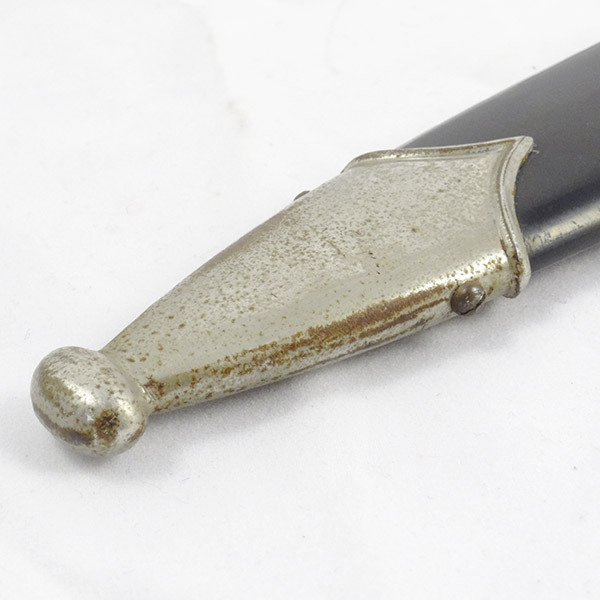 There are a few isolated and small areas of surface rust, but overall paint coverage is 98% easily. 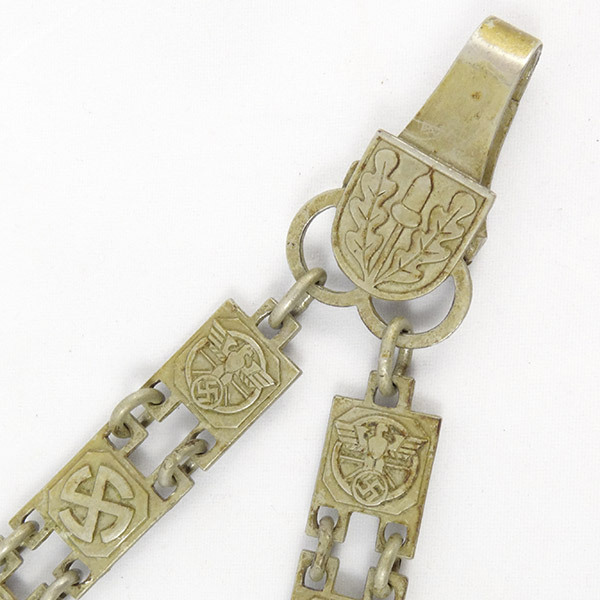 The nickel silver chain is in amazing condition! 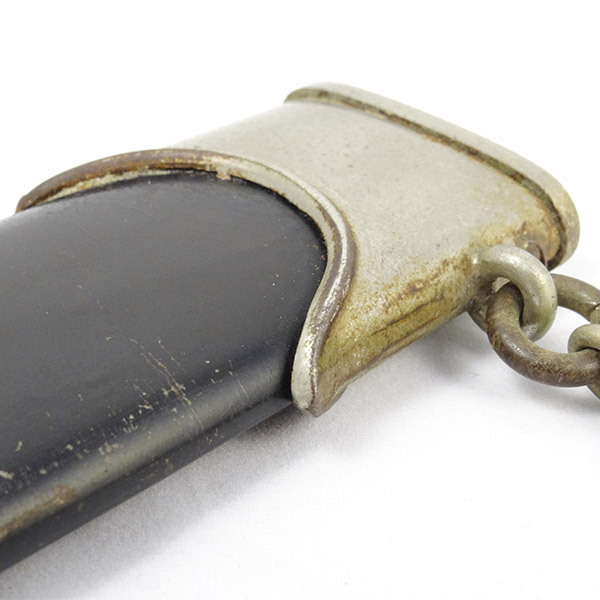 We usually see these with plated chains that have peeled or cracked or lost their plating altogether. 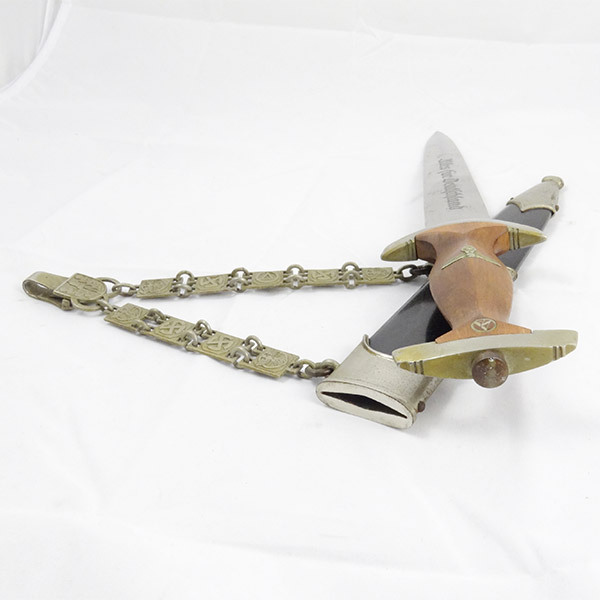 This one has the much harder to come by (and far more desirable) nickel silver chain and has toned to a color consistent with the dagger’s guards and eagle. 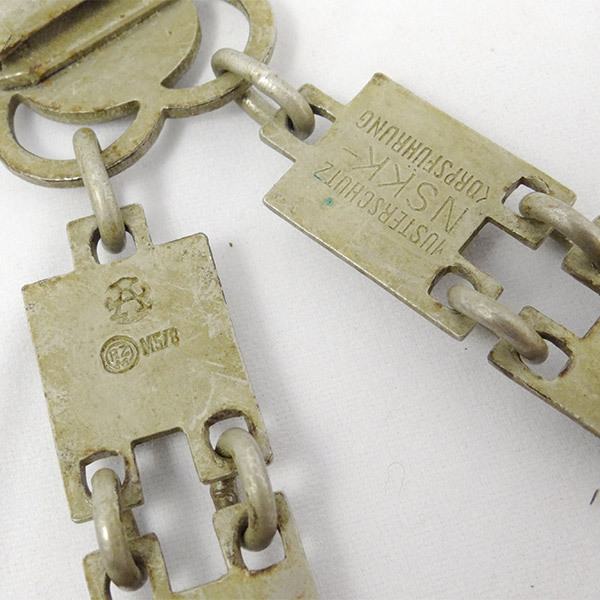 As a bonus there is the seldom seen Assmann “A” logo stamped into the reverse upper link of the chain just above the RZM 5/8 mark. 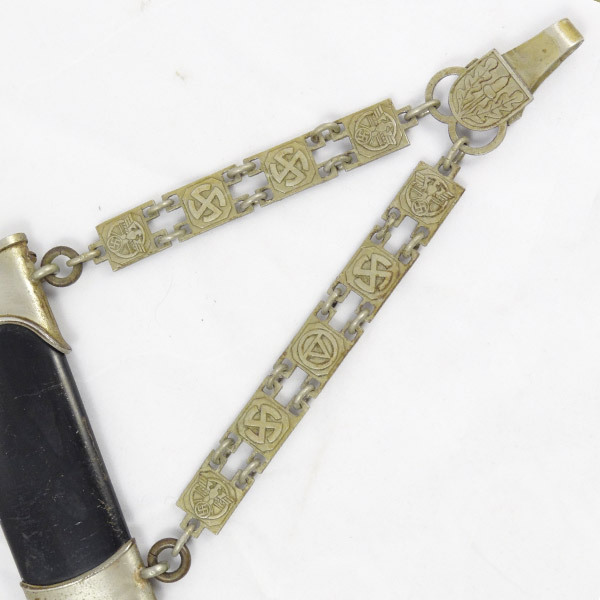 The Assmann maker’s mark stamp is extremely rare on these dagger chains! 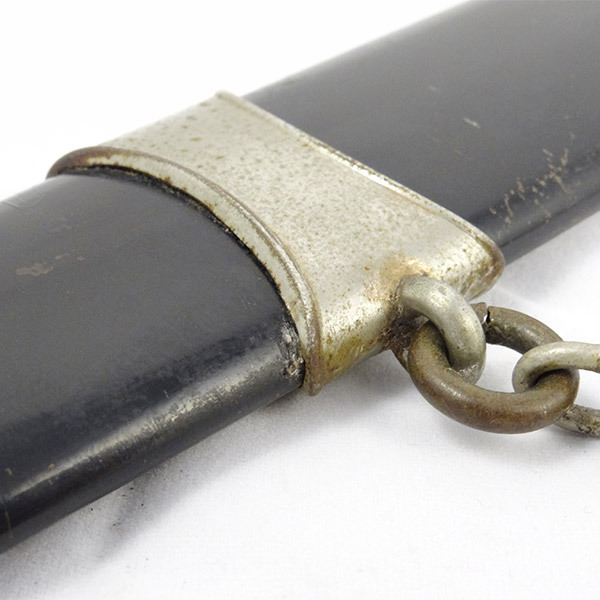 The chain’s clasp has a nice firm tension to the release, which is exactly what we want to see. 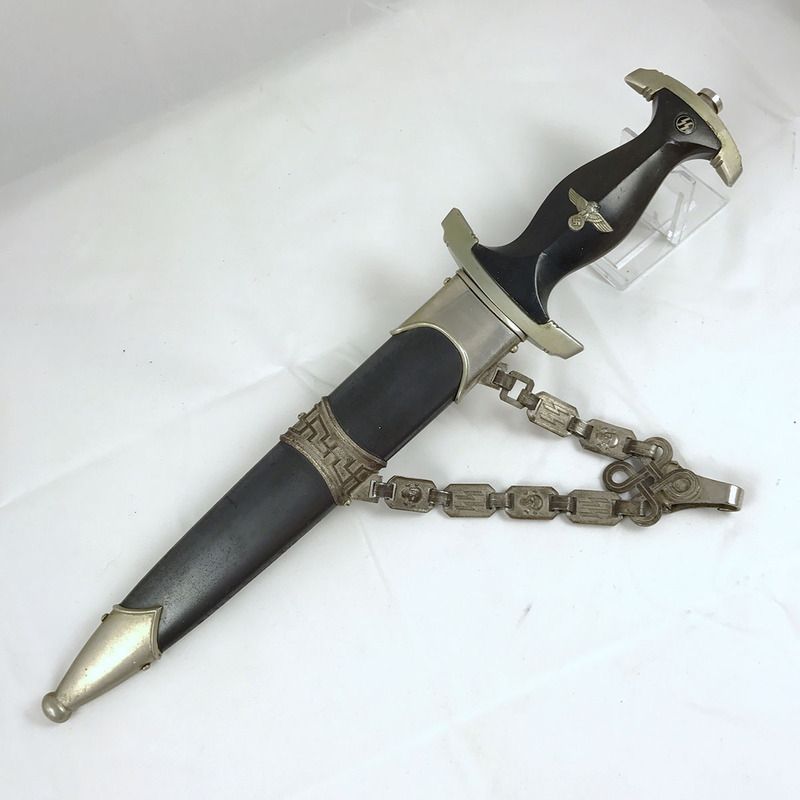 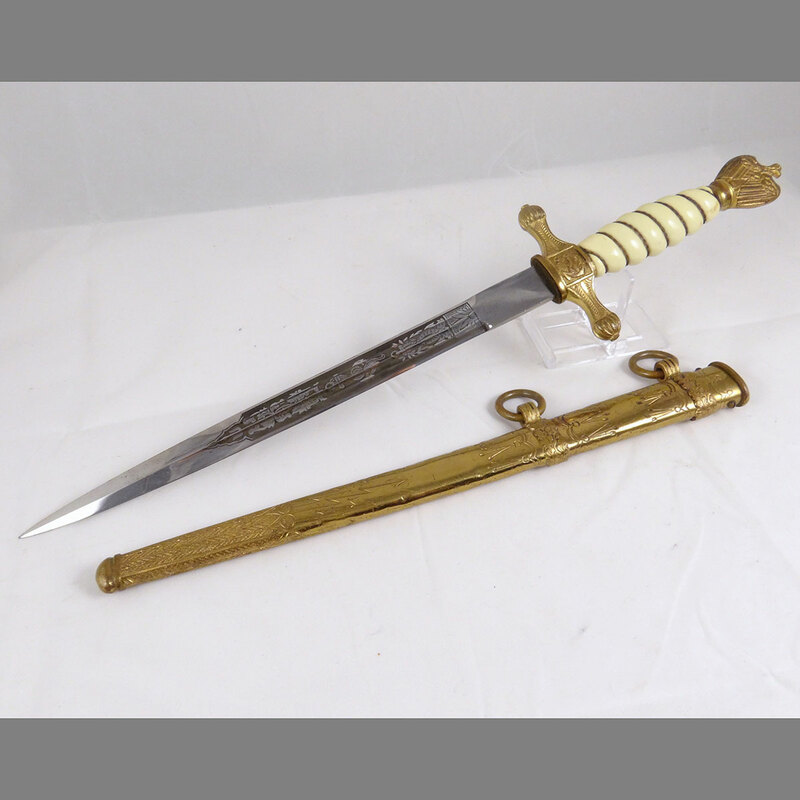 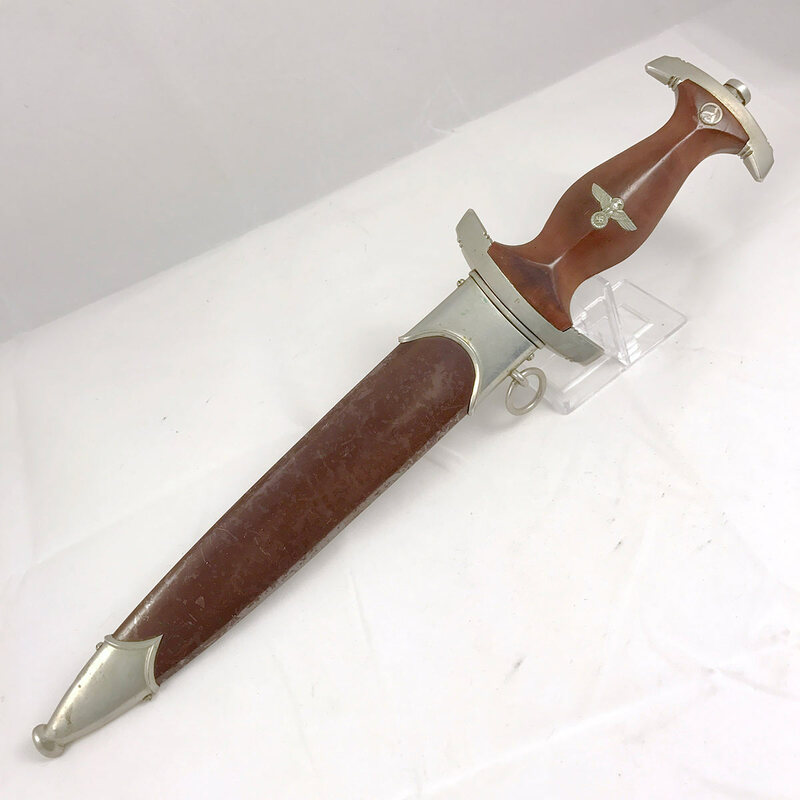 This dagger has the quality, style, and condition most collectors wait years to find, and with all the features that elude most chained NSKK daggers. 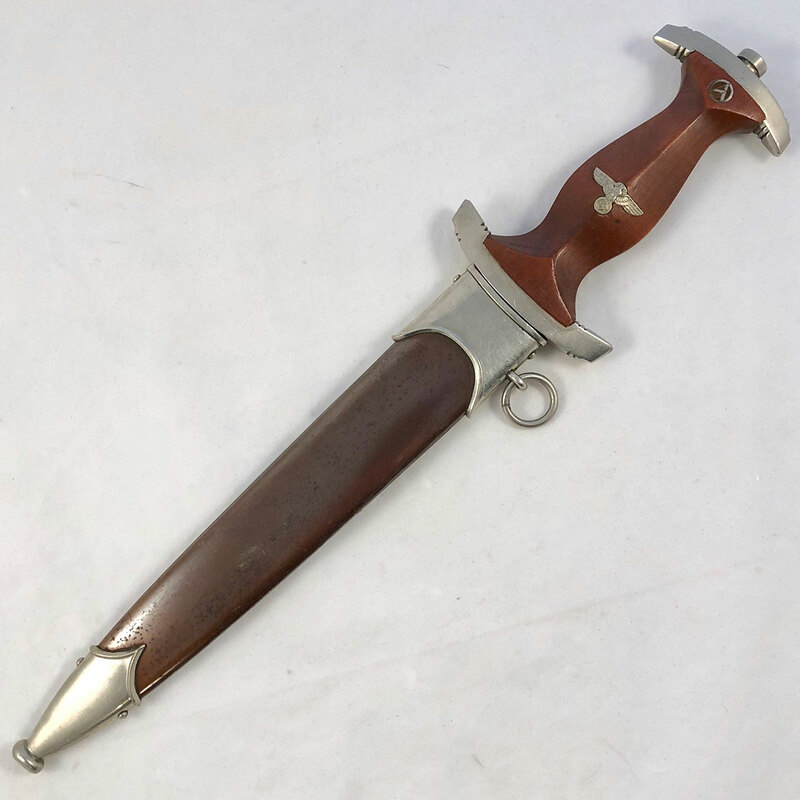 Don’t sleep on it or you may wake up to find it sold. 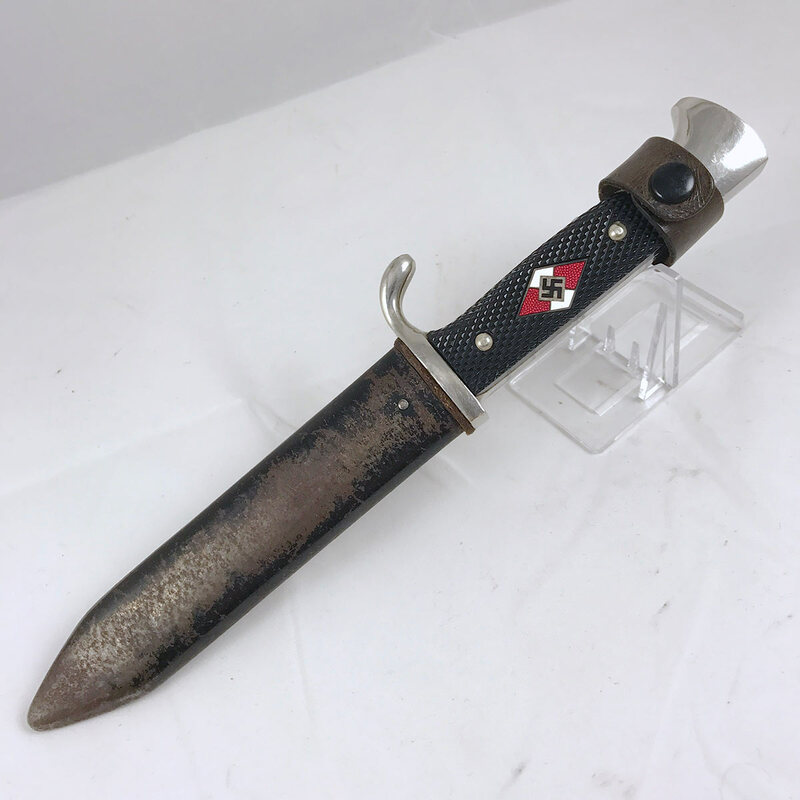 The price is very fair and won’t last long!